But it still feels bad. I went to Suchada today for some relief. I got beaten up, in the best possible way and stretched and pulled and rubbed and stomped on. Well, I ain’t so sure about my face, but I was more than willing to have them stomp on my shoulder. I awoke earlier than I thought I would on a Sunday, which is not a bad thing, I will allow myself to sleep in, but if I am not tired it’s just mental masturbation and the thoughts get rolling and there is no relief. Fingers crossed there will be some relief here in a few minutes. I just took a big dose of ibuprofen. When I got up this morning I felt good, stoked on the day, despite a smidgen of anxiety around having a day completely free and open to do anything I wanted to do. I wanted to practice, most of all, saying yes to the moment. Despite the coffee I had already imbibed I did go and have an Americano, so good. We sat in the little parklet outside the cafe and talked shop and chatted up the neighbors and I met some more folks in the hood and we hung out in the golden sun and the chill autumn air of the Outer Sunset, the ocean glistening benevolently in the distance, drawing my eye to it again and again. What also drew my eye? The big poster with a yard sale happening at 46th and Irving. Skate boards, surf stuff, girls clothes, art, bring your own cup mimosas. Ah, a hipster yard sale. I picked up a Bialetti Espresso maker and an awesome teal coffee mug for $2. The Bialetti itself, though not in the box, was obviously never used and brand new it runs generally $35 depending on what model you get. “Oh, you should get this!” My house mate pointed to a corner of the yard, they really were hipsters–the guy in the owl poncho was so hip I had to stand a little back and bask in his hip aura–and I was having fun picking through the goofy tchotkes they had, I turned and she was looking at two boogie boards. I don’t even know what a boogie board is, but I have heard tell they are wild fun. There’s no standing up and you just play in the white water. I will put on my wet suit and go on down to the beach and play. I have not been able to re-connect with my friend with the long board, but as he’s back in town from a recent vacation I suspect I will soon. I do have the tentative date to go to Pacifica next Sunday with the girl I ran into last night in Noe Valley and if I can’t get to him by then I figure I will just rent a board in Pacifica, get a taste of another kind of board experience. Anyway, the idea of going out to play in the water sooner than that was really appealing and when my housemate and her boyfriend, who is a surfer amongst many other things, said, it’s a good boogie board, get it. 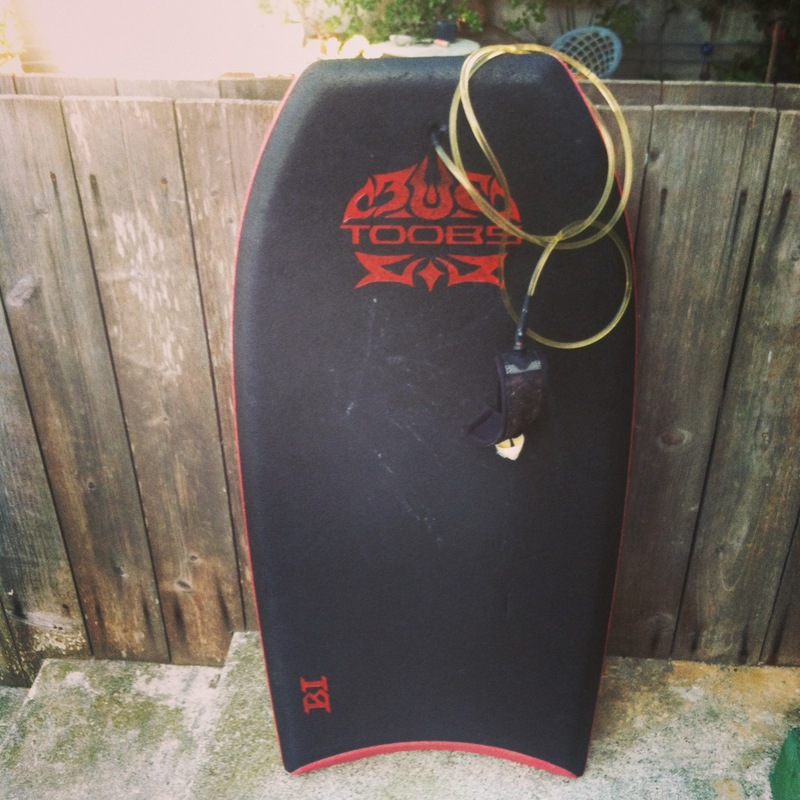 And now I have a boogie board. I was ready to leap off into the sea right then and there. “Excellent, now I can just go out and not have to wait for anyone to have the time to go out with me,” I said gleefully hugging the little board under my arm. The difficulty for me has been meshing up schedules for the surfing to happen. “Oh no you don’t,” the boyfriend said, and my housemate, linking her arm in his, agreed. Then her boyfriend told me a nice little horror story about how it had happened to him. But I still want to go. I know I should go with someone though. Even if it is just to sit and watch me wave good-bye as I get pulled out to sea and drift off toward the horizon to be devoured by sharks. At least there will be someone to tell my housemate she can rent the in-law out again and my parents might want to know. I might have gone down today, but I had managed to get myself booked in to Sudacha. Both the housemate and the boyfriend assiduously recommended it. They sort of put the fear of God into me by how tough it was going to be. So when I got there I made sure I checked the box that said first time and as I looked over the areas of the body I wished them to focus on I paused while debating the level of pain I wanted to be in: Soft, Medium, Hard. Traditional Thai massage is done with hands, elbows, and feet. There was going to be someone standing on my shoulders. I couldn’t quite bring myself to circle soft. Turns out I probably could have circled hard and I may just do that the next time I go. It was intense and I felt muscles that had not been massaged in years singing their creaky hoarse way bright and clear and loud. I am going to make an appointment to be seen by my doctor again at Kaiser now that I have officially received clearance to go to them via Healthy San Francisco. Which is not free, but is something I can handle at this time. I also received a nice welcome back letter informing me that I would still be able to see my old primary care physician. The ibuprofen has not kicked in yet, I will be taking it easy the rest of the night, and picking more up tomorrow. I have a full week of nanny. And be grateful that despite not getting all the kinks worked out, I did get a lot of attention to an area that needed it bad. It was also really good for me to lie still for an hour. More of that in my future.